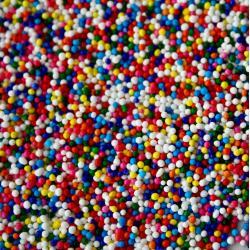 Non-Pareils Tiny Pastel Mix - 16 oz.. These pastel mixed color edible treats can be used to decorate your cakes, cupcakes, cookies, other baked goods and ice cream. Perfect for Easter. Ingredients: Sugar, Corn Starch, Confectioner's Glaze, Carnauba Wax, Yellow 5, Red 3, Titanium Dioxide, Red 40, Blue 1, and Blue 2. ALLERGEN INFO: This product is prepared and packaged using machines that may come into contact with WHEAT, EGGS, MILK, SOY, and TREE NUTS. 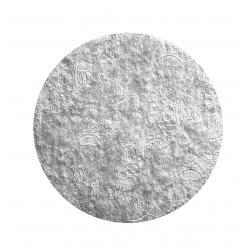 Silver 0.08" Embossed Round Thin Board - 12"